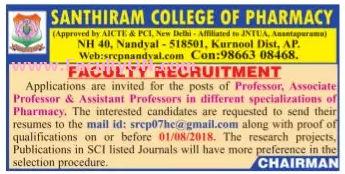 Santhiram College of Pharmacy, Kurnool has advertised in the SAKSHI newspaper for the recruitment of Teaching Faculty- Professor / Associate Professor / Assistant Professor jobs vacancies. Interested and eligible job aspirants are requested to apply on or before 01st August 2018. Check out further more details below. About College: Santhiram College of Pharmacy, since its inception has been performing exceptionally good to meet its goal of providing quality pharmaceutical service to the society. The pharmacy education needs are increasing in the society. To meet these requirements Santhiram College of Pharmacy is striving to provide the highest standards of quality pharmacy education. Under this Management, a number of Institutions have been started, and they are flourishing very well. M.Pharm / Ph.D. The research projects / Publications in SCI listed journals will have more preference in the selection procedure. How to Apply: Interested and eligible candidates are requested to send CV along with copies of certificates and recent passport size photo to the email address given below.